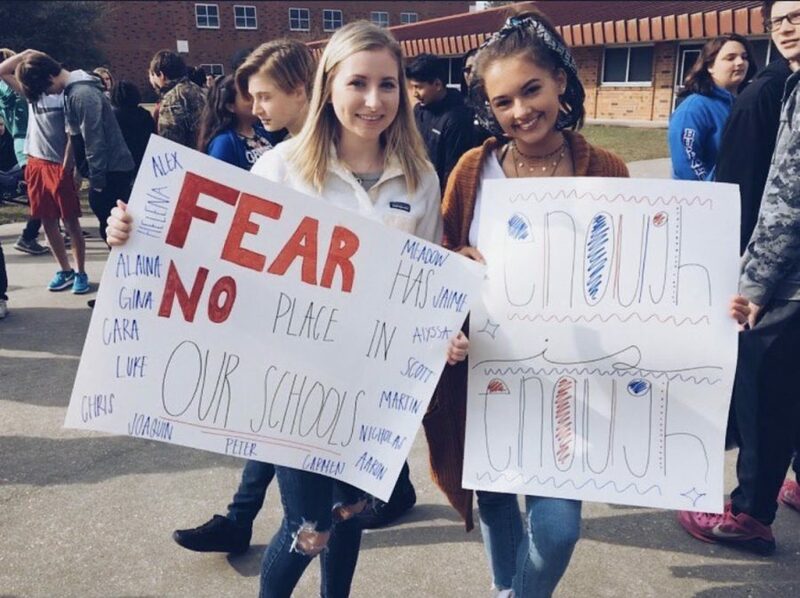 Maddie Cagle (left) at the school walkout. March 14, exactly one month after the mass shooting at Majory Stoneman Douglas High School, students organized a school walkout to honor the lives of the 17 individuals who were lost. Teenagers nationwide participated in this 10am walkout, including senior Maddie Cagle, who registered West Brunswick to be a part of the march. “We need to take action to go ahead and move forward with the world that we’re gonna live in,” Cagle told the West Wind. She believes that young people should take action where it seems, to her, that the people in power are doing nothing. The recent increase in school violence has influenced an uproar in teens around the country and the world. Teens, as well as adults, have been taking action everywhere, protesting and speaking out for their rights. Protests, marches, and boycotts have been taking place across the country in protest of the violence. Cagle herself agrees that young people should mobilize.